The Royal Doulton Lord of the Rings collection is one of my favorites, and is one set of Doulton figures they have remained extremely collectable. The collection began to be released in 1980 and was designed by D Lyttleton with production ending in 1984. In Lord of the Rings, Tolkien gave these characters life. Royal Doulton has given them form. Through Tolkien’s Lord of the Rings you entered their world. Now, through Royal Doulton, they can enter yours. 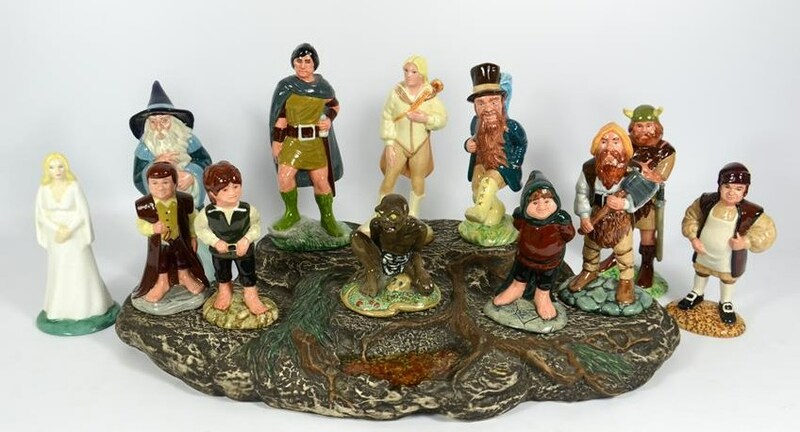 The Royal Doulton Lord of the Rings collection included 12 figures and a base: Gandalf HN2911, Frodo HN2912, Gollum HN2913, Bilbo HN2914, Galadriel HN2915, Aragorn HN2916, Legolas HN2917, Boromir HN2918, Gimli HN2922, Barliman Butterbur HN2923, Tom Bombadil HN2924, Samwise HN2925 and a Rockwork base ceramic display stand. The figurines intially sold from $35 to $50.